The Swell Future-Friendly Design Exhibition is in its third year. 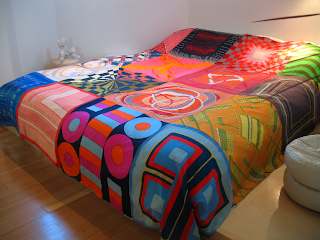 Curated by Propellor Design, Swell will be exhibiting Ouno Design’s Vintage Scarf Bedspread (above) along with sustainable design from about 30 international designers, April 20 – May 18 in Vancouver. HSBC Lobby, 855 West Georgia Street. Mon – Wed 9-6 pm, Thurs and Fri 9 – 9 pm, Sat 9-5 pm.